Free Shipping Included! 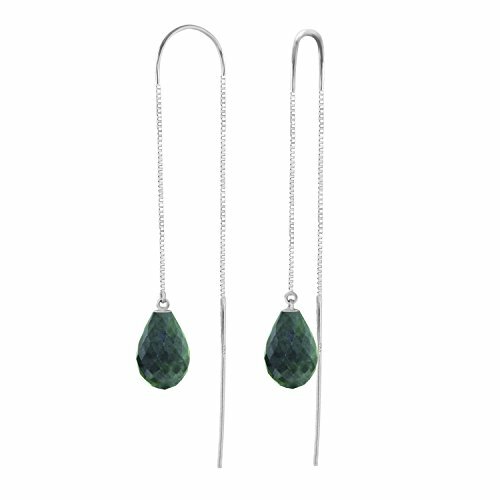 6.6 Carat 14k Solid White Gold Dyed Briolette Emerald Threaded Earrings by Galaxy Gold at Blood of The Young. MPN: 3938-W. Hurry! Limited time offer. Offer valid only while supplies last. An elegant 14 karat Solid Gold Threaded Earrings featuring two briolette shaped 9x6mm Green Corundum. It comes in a elegant black velvet jewelry box. An elegant 14 karat Solid Gold Threaded Earrings featuring two briolette shaped 9x6mm Green Corundum. It comes in a elegant black velvet jewelry box. These earrings weigh about 1.80 grams. Certificate of apparaisal is available upon request. Other metal colors are also available. Wearing this earrings will make her feel like royalty. It will surely add sparkle to any kind of outfit. Stylish and easy to wear. A perfect gift that would never be forgotten for a special woman born on May. Enjoy this precious gemstone earrings for life! Manufacturer's appraisal is available upon request. Item comes with tag without retail price. Tag with retail price is available upon request. Picture may appear bigger than the actual item. Please read the product description and specifications. Available in Yellow, White and Rose Gold. Elegantly presented in a black velvet jewelry box. Manufacturer: Galaxy Gold Products, Inc. Publisher: Galaxy Gold Products, Inc. Studio: Galaxy Gold Products, Inc. If you have any questions about this product by Galaxy Gold, contact us by completing and submitting the form below. If you are looking for a specif part number, please include it with your message.